From NBA guard to NBA insider? Maybe that's the case here. 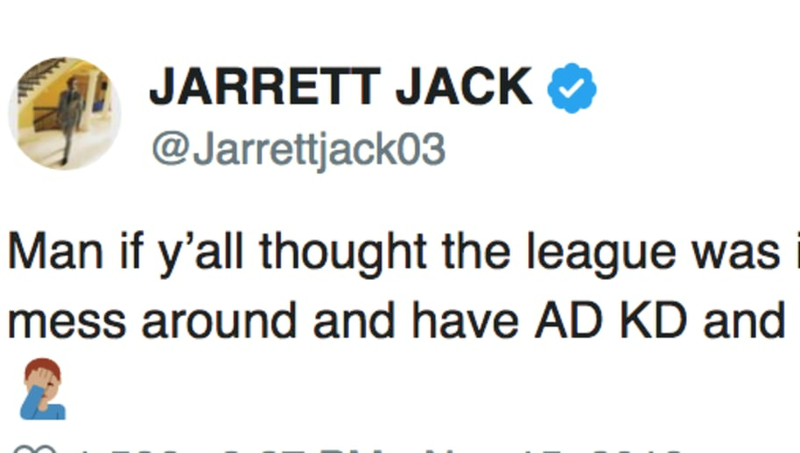 On Thursday, journeyman point guard Jarrett Jack had a simple message for the NBA world: it's going to happen in 2019. Yup, might as well book it now... Kevin Durant and Anthony Davis are going to join the Lakers next season. ​​Even if just ​Durant came to the Lakers, there would be an argument L.A. would become the best team in the league. Now throw Davis in there and you have potentially the most talented team in NBA history. Davis is currently under contract until the 20-21' season and KD's future with Golden State is still undetermined after ​this week's ​fallout. However, Jack is not the only person who believes the Lakers could end up having the three superstars ball out together. Not only would the Lakers landing KD and AD shift the balance of power from the Warriors, but it would change the entire dynamic of the league and set back teams like Boston and Philly, both poised to be the next dynasties.